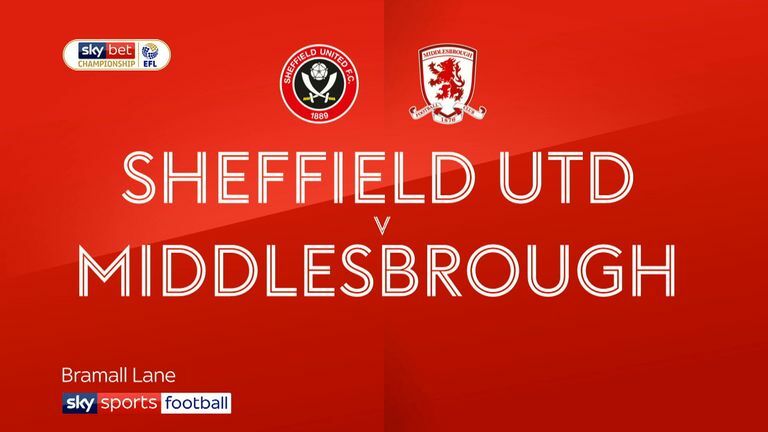 Highlights from the Sky Bet Championship fixture between Sheffield United and Middlesbrough. 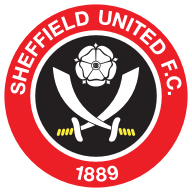 Richard Stearman was Sheffield United's unlikely hero as his first goal of the season secured a 1-0 win at home to Middlesbrough as the Blades closed in on the Sky Bet Championship top two. The substitute headed home Oliver Norwood's cross just past the hour mark to see off a spirited Boro side, who had Daniel Ayala sent off two minutes later, as United showed no ill-effects from their Villa capitulation last Friday night. The home side started the better and after McGoldrick had a tame effort saved by Darren Randolph, Mark Duffy then let fly from 25 yards only to see the Republic of Ireland stopper produce a wonder stop to prevent the ball from arrowing into the top corner. It took the visitors 16 minutes to have a first sighter, with George Saville dragging an effort well wide of Dean Henderson's left-hand upright. Influential Boro defender Aden Flint hobbled off just past the half-hour mark, but it was the visitors who were next to threaten when Jordan Hugill's 20-yarder was superbly kept out by the flying Henderson. The on-loan Manchester United stopper was blamed for two of the goals conceded against Villa, but on a night when Bramall Lane applauded the memory of Sheffield-born Gordon Banks, who died this week, the 21-year-old showed goalkeeping skills the World Cup winner would have been proud of. United defender George Baldock limped off late in the first half, before leading scorer Billy Sharp brought out a save from Randolph with the last kick before the break. Boro came out of the traps well at the start of the second half and after John Egan headed George Friend's effort off the line, Henderson then had to be alert to save from sub Stewart Downing. Play immediately switched to the other end where Gary Madine, a half-time replacement for Duffy, managed to get on the end of Norwood's cross, despite being tugged back, and forced a save out of Randolph. 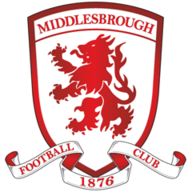 The second half was much livelier than the first, with a series of Boro fouls and refereeing decisions enraging the home crowd, but it was the linesman who played a part just before the hour mark, correctly flagging Sharp for offside as he smartly turned in Madine's cross. The Blades, though, were not to be denied a minute later as sub Stearman powerfully headed home Norwood's pinpoint cross to hand United the lead. Boro's woes were compounded two minutes later as Ayala's rash challenge on Kieran Dowell was rewarded with a second booking and an early bath to leave Tony Pulis' men right up against it. The visitors still posed a threat with 10 men and Hugill and sub Britt Assombalonga combined well, with the latter forcing a low save out of Henderson, but United saw the game out to register a vital three points. 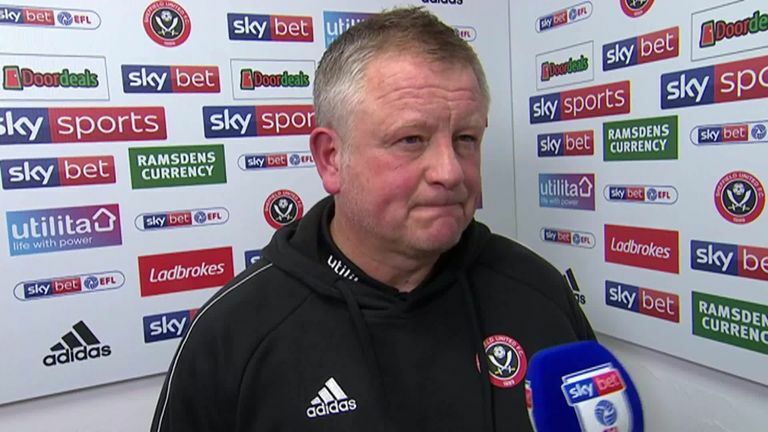 Sheffield United manager Chris Wilder shared his thoughts after the Blades' 1-0 win over Middlesbrough. Chris Wilder: "It's been a really difficult couple of days. We felt we had to produce a big performance against a very physical and direct side. We had to match them, although I didn't think we did in the first half. We lost too many first and second balls and it was pretty even. "We had to be a little bit more positive in our play in the second half and I thought we were and we have won a tight game. It was top end Championship football and I think a fair assessment is that we shaded the second half. I always thought we looked likely to score and win the game and thankfully we've done that." 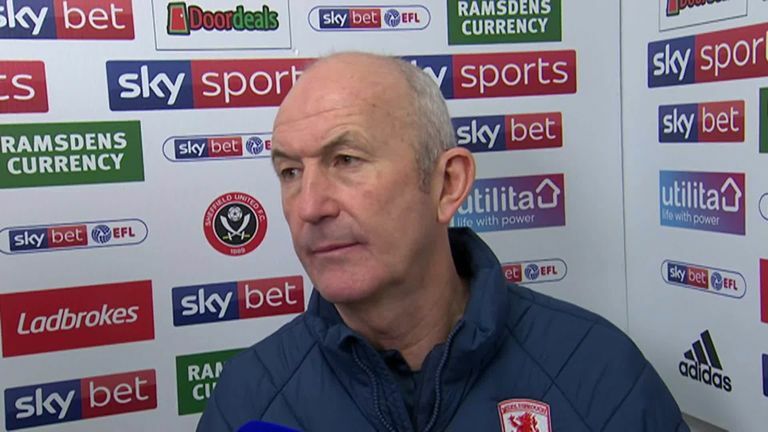 Tony Pulis criticised referee Andy Woolmer for his decision making as he felt Richard Steerman was impeding Dael Fry in the build up to Sheffield United’s goal as the Blades beat Middlesbrough 1-0. Tony Pulis: "It was a big game, but my disappointment was with the two decisions for the goal. The linesman giving the first free-kick, when there was lots of stuff going on all night worse than that but not being given. And then the goal, he's got his arms right over Dael (Fry) and if he's going to give the free-kick for the foul out wide, then it's beyond belief then that goal stands. "I am disappointed. That was the referee's eighth game this season in the Championship - we have played 32 this season. I don't blame him, but those at the top… they're getting Premier League referees to officiate games and that is disappointing. To give someone who has only refereed eight games a match of this calibre tonight, it is difficult to understand."